A wide range of GPS information on the Sandia Mountains is available for downloading from this web site. Most of the GPS data was recorded with a Garmin GPSr (GPS receiver), but the download files are available in four different formats: Garmin Mapsource, Google Earth, GPX, and G7toWin. Appendix 3 in Sandia Mountain Hiking Guide lists 354 GPS waypoints in the Sandia Mountains that are referred to throughout the book. To go to the Waypoint Download page, click here. A GPSr is capable of recording a "track" as you take a hike. Such a trail track might save several hundred latitude / longitude pairs that are recorded every 50 feet or so as a log of exactly where you have hiked. 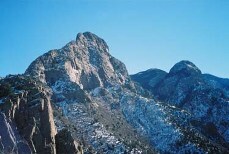 I have recorded trail tracks for all of the 57 trails in Sandia Mountain Hiking Guide. These trail tracks (in the four different file formats listed above) are available for downloading. With the proper software, for example Garmin's Mapsource or the G7toWin program) you can then upload a trail track into your GPSr. Then, as you hike that trail you have a GPS trace of exactly where the trail runs (for example, in case you have ventured off of the trail or have taken a wrong turn). To go to the Track Download page, click here. If you have a Garmin GPSr with mapping capabilities we have a nice contour map of the Sandias that you can upload into your Garmin GPSr. 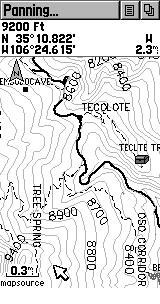 The map includes tracks of most of the trails and roads. To go to the Garmin Contour Map Download page, click here. Copyright 2008, Mike Coltrin. All rights reserved.